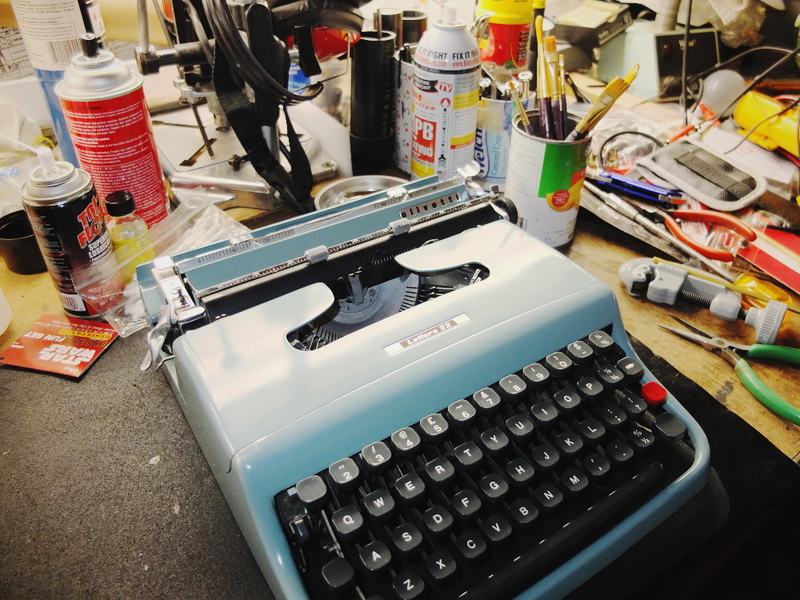 Post-Script: Hopefully, by next week the weather will be much improved and I can set the next Typewriter Video Series episode somewhere a bit more interesting than my garage workshop. I do understand, however, that future videos may require an indoor setting, so I need to think about how to make the workbench "set" a bit more photogenic. 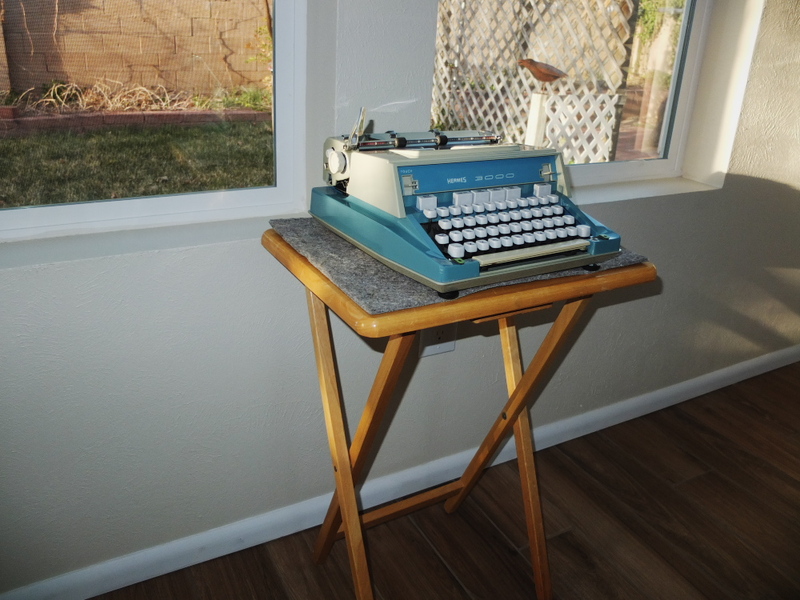 I have to sit fairly close to the bench to be in the sweet spot of lighting, and in order to get a medium shot along with the typewriter I have to shoot down the length of the bench. Perhaps some kind of wall decor along the left side of the bench can improve the look. I'm using as a mental reference the great studio room that Ted Forbes uses in his "Art of Photography" YouTube channel, which serves as inspiration for me in how it's properly done. The thing I really don't want to think about is why I let the workbench get so cluttered. It really happened over the course of years, with various projects I'd start, then let fall to the side as other things took precedent. Having such a large workbench also makes it tempting to be used as a "catch-all" for whatever clutter doesn't seem to fit in the house; the garage seems to function as a halfway point between the house and the storage shed in the back yard. 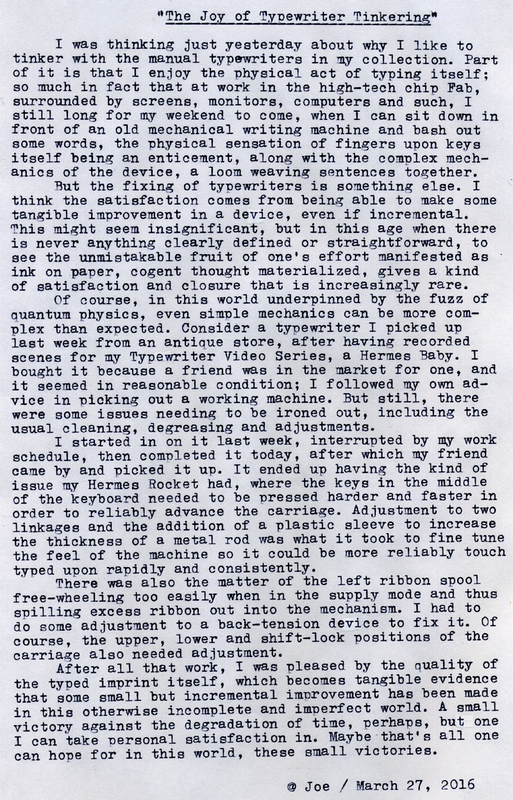 This idea of dedicating typewriters to certain physical locations, such as a workshop or car trunk, is an interesting one, probably unique to this post-typewriter era where machines in decent condition can be more easily procured than in their heyday, when they were very expensive relative to the average person's income. 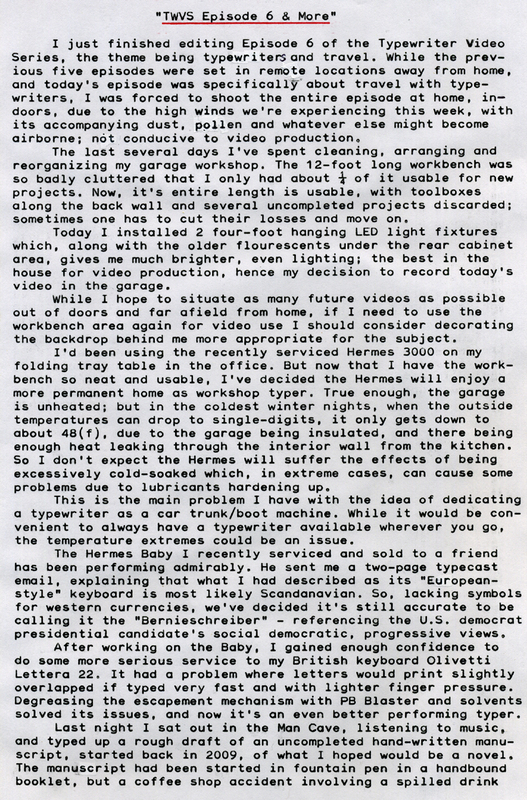 So us typewriter-using collectors now find ourselves in a kind of renaissance of mechanical type, where a small collection of usable machines can be easily built up over time; the surplus of machines in one's possession thus begging the question of what to do with them, besides storing them in the closet or under the bed. Putting them to good use, each to a dedicated area or purpose, becomes logical. 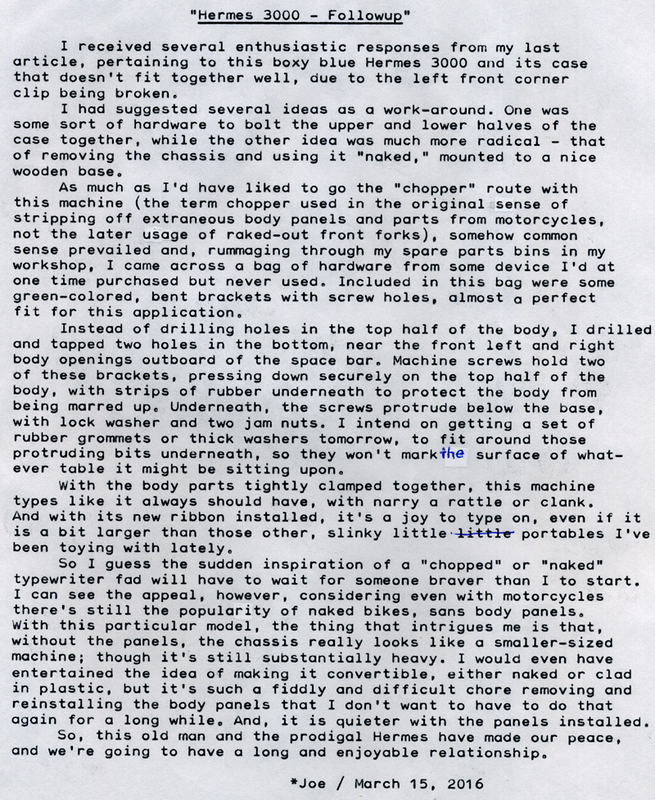 I think there are two aspects to the typewriter hobby. There's the "typewriter fondling" aspect, where touching and servicing them is paramount. 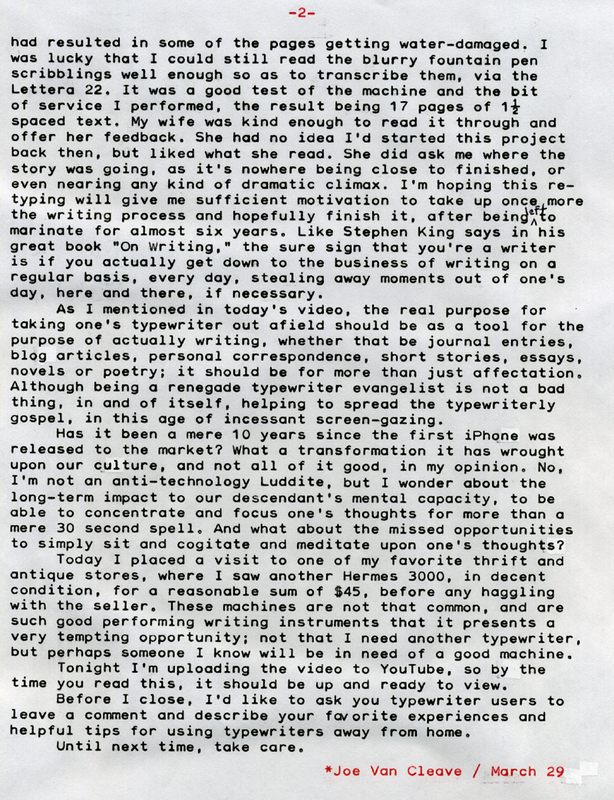 Then there's the writing aspect, putting typewriters to good use for the purpose of actual writing. 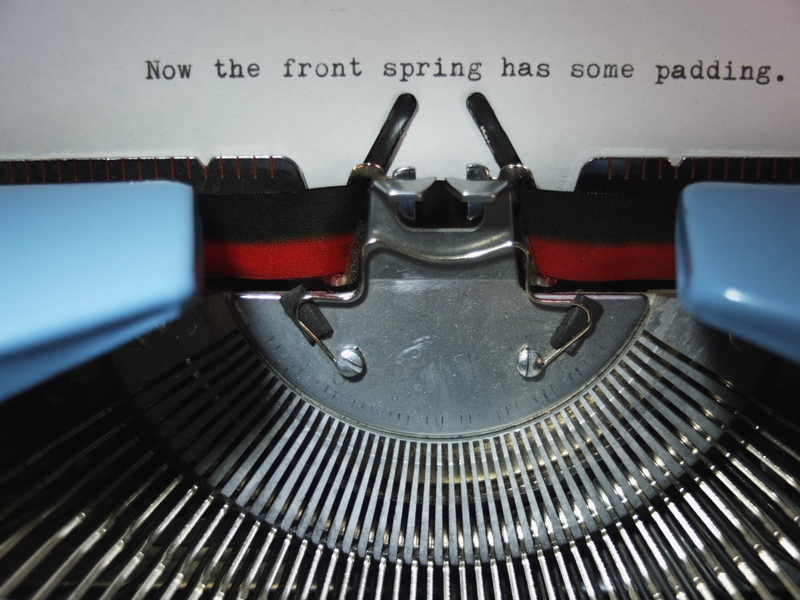 Of course, a person doesn't have to be a world-renown author to have some serious purpose in using a typewriter. But what they seem to do, because of their focused purpose in being specifically useful only for writing, is to force us to face the issue of being literate and being able to write. There was an age, earlier in the last century, when it was assumed that the average person could write with little difficulty. Not so these days; which makes the purpose-focused utility of the manual typewriter all that more important. 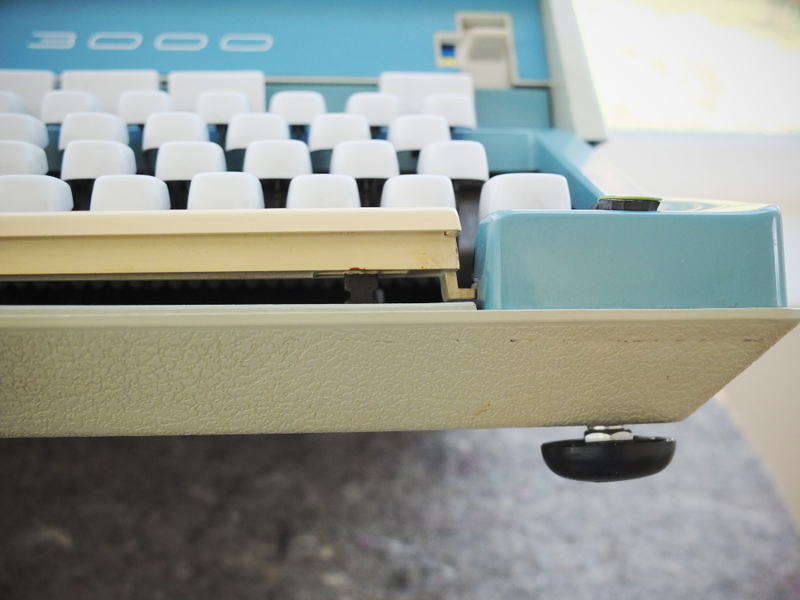 Typecast via Hermes 3000. It sure has been getting a lot of attention lately; and deservedly so, given how well it types and prints. 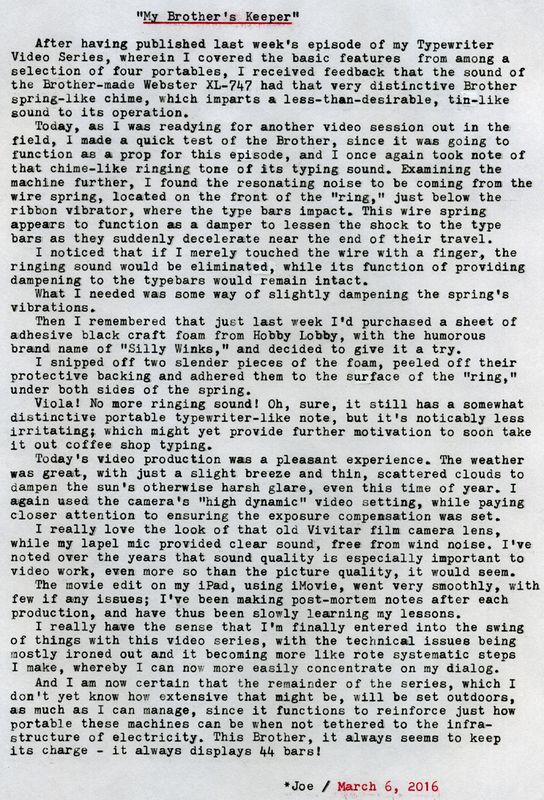 Post-Script: I like the idea that typewriters provide such an enjoyable user experience, engaging both the physical senses as well as one's intellect, while also providing opportunity for exploring their inner workings and discovering their hidden design features. 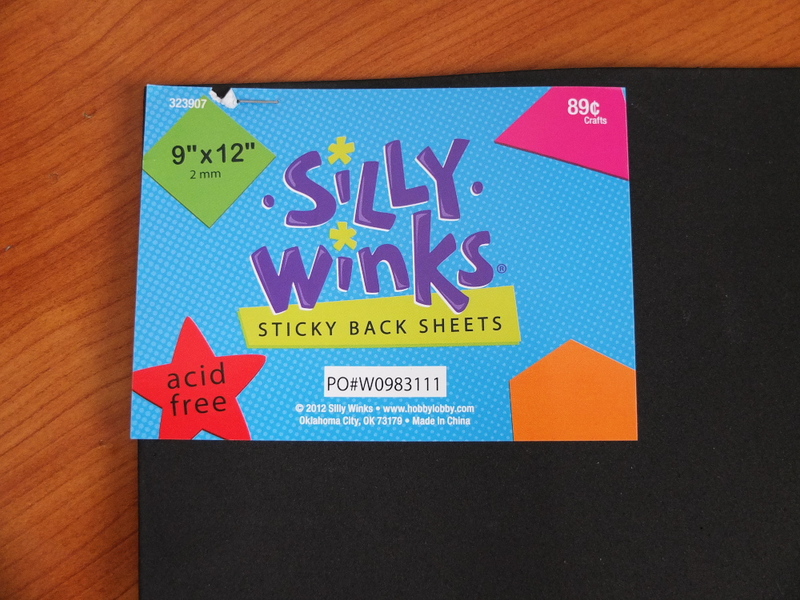 And, they're practical; you can actually write with them! I didn't take an opportunity to photograph the Hermes Baby mentioned above, but it's virtually identical in appearance to my Rocket. I did type an earlier version of this article using the Baby and a combination red/black ribbon, but I wasn't entirely happy with the two-tone, red/black effect to the imprint, since this machine lacks a ribbon height adjustment and therefore uses the middle of the ribbon; I've subsequently installed an all-black ribbon. The machine also has a European keyboard with accent marks, and lacks both the dollar and pound currency symbols; which led my friend and I to joke that this was an anti-capitalist machine, a Bernie-typer. Long live the revolution! 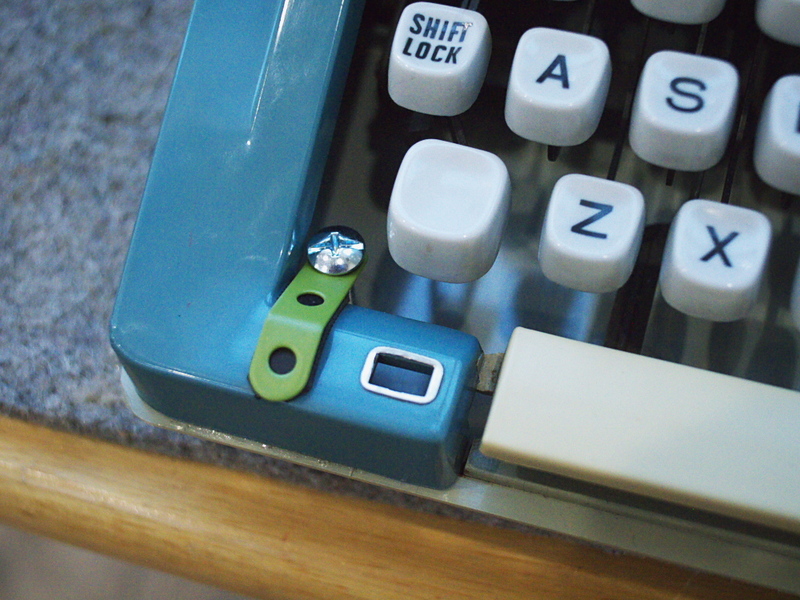 Typecast via Olivetti Lettera 22 with British keyboard. 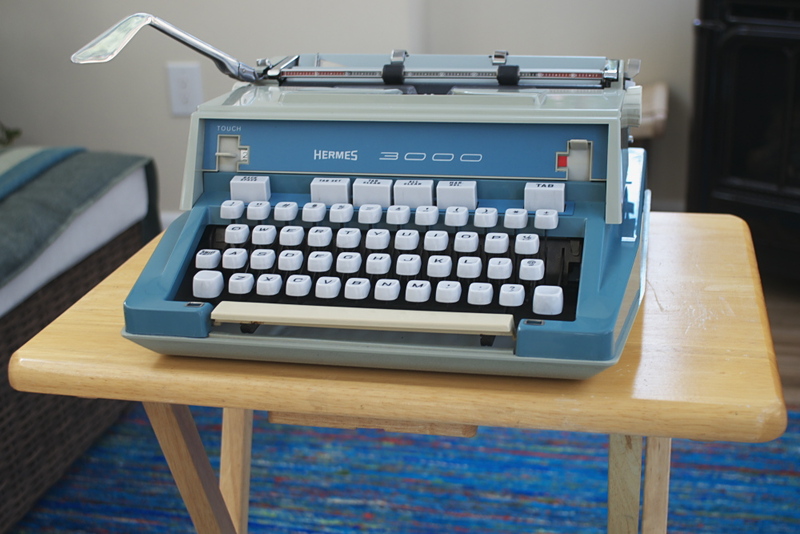 Post-Script: Here's a shot of the Hermes 3000 (used for this typecast) I took last week with the little Fujifilm X10 using onboard fill-flash. I like the late-afternoon sun illuminating our patio room, while the backyard can clearly be seen through the windows, including the metal raven yard ornament, which serves to keep the pigeons away. I'm really liking this typewriter the more I use it, and the looks and styling are growing on me. If you have any suggestions for future episodes in this series, either for content or setting, please let me know in the comments below. Thanks for watching. PPS: Here's a link to Field Notes brand notebooks. 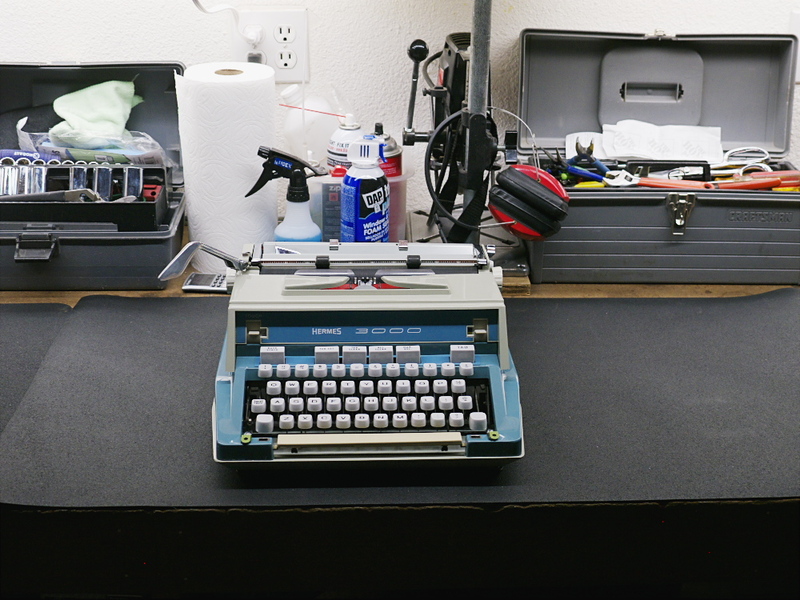 Episode 4 of the Typewriter Video Series is up on YouTube. In this episode I talk about the basics of changing ribbons, making corrections, and a tip for typing outdoor in the wind. 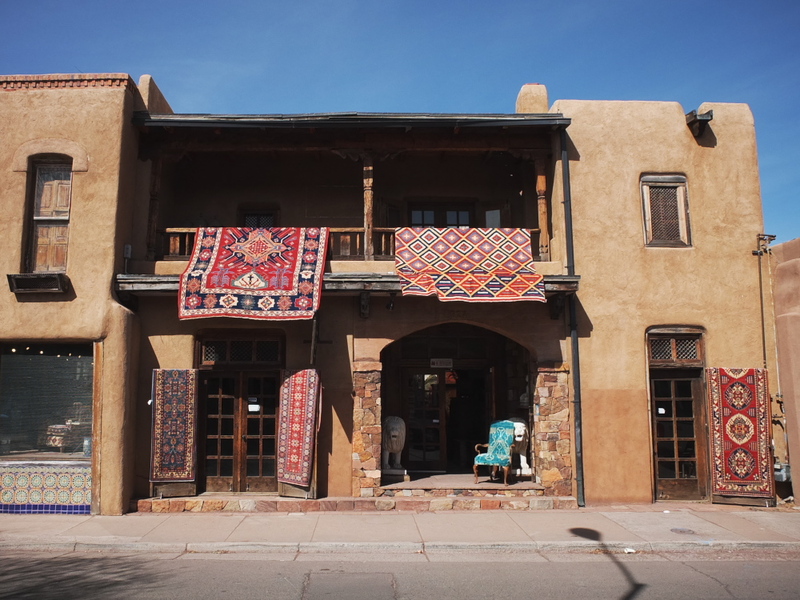 This was a breezy morning, bordering on downright windy; ah, spring in the southwest U.S.! Yet my lav mic worked rather well in quelling any wind noise. You'd think from the setting of these videos (in public parks) that all we do in Albuquerque is walk our dogs in circles. 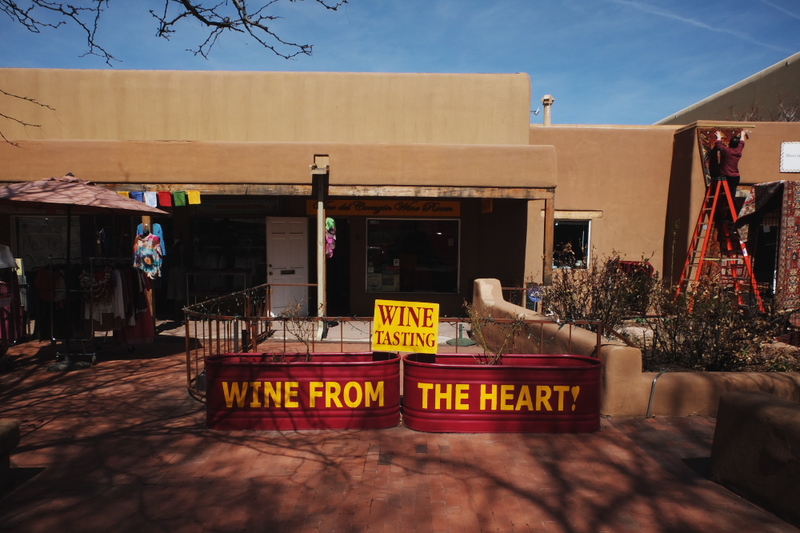 We were up in Santa Fe today. Here are a few photos. This came out about as well as I could have expected, with minimal alteration to the body panels and while still permitting me to take it apart, should it need more service in the future. Taking this machine apart and putting it back together again intact is a real lesson in both patience and frustration. The rear of the upper body half has to be precariously bent to release the clips from the bottom half; it will only do that so many times before something else breaks. I still don't have the exact procedure down. One result was the right side carriage cover panel snapped in two, but you'd never notice it from the back of a moving horse. But it serves as caution against the idea of converting the chassis back and forth between "chopper" and fully-clad typewriter. I suppose the dream of a naked typewriter will have to wait for another day. Unless, that is, I absolutely need to address some internal problem and the body panels just happen to break in the process. Post-Script: Here's a close-up of the left front corner, adjacent to the space bar, where the two body halves had once been glued together. A small c-clamp will served to hold both halves together tightly, but it gets in the way of my left hand while typing. 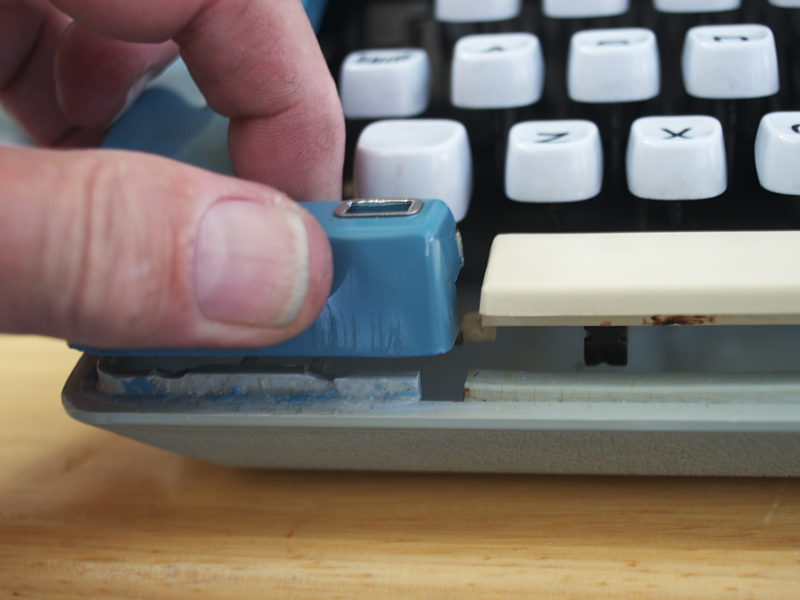 Yes, I could just wedge a piece of craft foam in the gap between the two halves, while typing, to keep it from rattling; and use a belt or strap while lugging the machine by its clam shell's handle for transport. But I'm really intrigued by the idea of removing the chassis and mounting it, naked, to a nicely finished base of plywood. What do you think? And what do you make of the font style? I love it; another reason to keep the machine and try to make it more usable. Post-Script: I had a blast doing yesterday's production, everything seemed to go very smoothly. It's always interesting to get a glimpse of what happens behind-the-scenes with video production. I have two lapel mics, one being an older model, purchased years ago from Radio Shack, while the newer one has much better audio quality but also has a 16 foot wire, which I struggle with keeping properly stowed away in my jacket or pants pocket. The older mic is only monaural, and I had recently acquired a mono to stereo adapter, in the hopes of using it for this project, but with this adapter in place it doesn't seat fully into the mic jack of audio recorder, and as a result makes an intermittent buzzing sound. So I'm relegated to using the newer mic with longer wire. Both mics are powered by small "watch" batteries, and I have spares on hand, should they be needed. As usual, I love to talk, and thus the first cut of this production went well over 16 minutes in length, too long for You Tube, so more cutting and trimming was required. But I think the end result was better for it. Just like as in writing, cutting down is essential for good results. 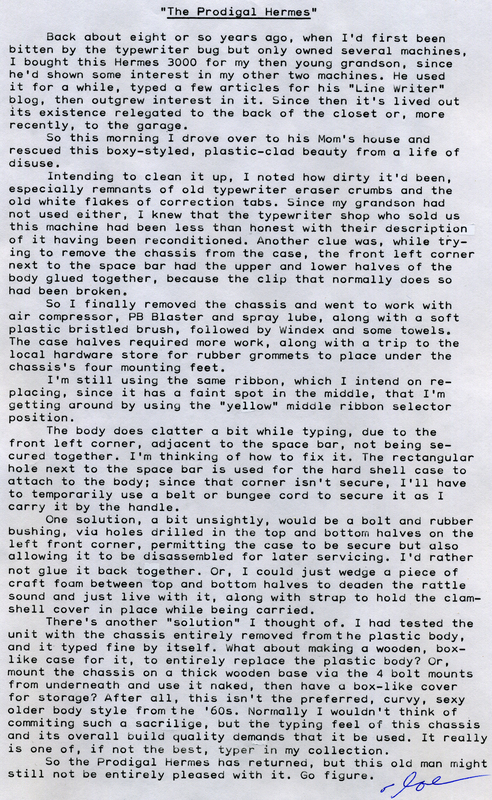 Getting back to the main subject of this blog article, dampening the sound of the Brother, I wonder why I never thought of tracking down this irritating sound before, because the addition of those two little pieces of black foam certainly makes this machine sound much better. It's indeed funny how the typewriter over the decades has experienced a usage change. 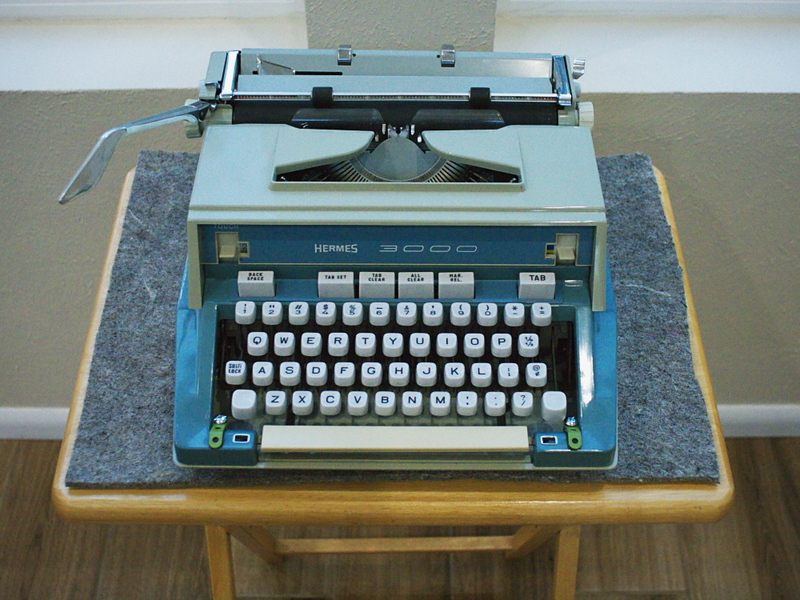 In their heyday perhaps no one would have thought much about the peculiarities of the sounds made by specific models, since all typewriters are essentially noise-makers; but now that they've been rediscovered and repurposed into more recreational writing machines, their aesthetics become more evident. 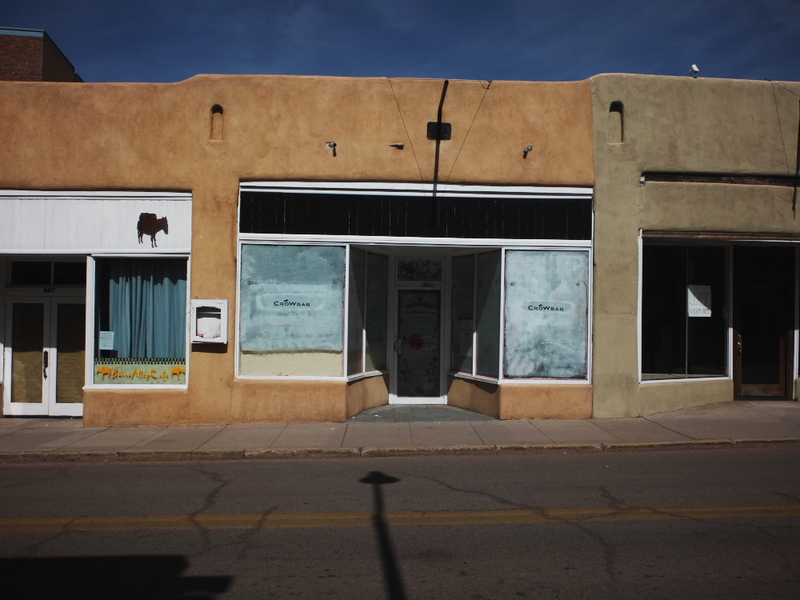 Photos via Fujifilm X10. Typecast via Brother-made Webster XL-747. Post-Script: I left the iPad to upload the video, late yesterday evening, and went to bed. This morning I checked the results and upon initial playback on YouTube the video was stuttering and lip sync was terribly off (by several seconds at least), which considerably disheartened me, as that implied I'd have to delete the video and start over from scratch. But then I had the good sense to check it on my laptop PC, and much to my relief it played fine. The problem appears to be the iPad itself, a continuation of the same sort of problems I was having while performing the edit yesterday. So afterwards, I hard-booted the iPad and it subsequently played the video just fine. I realize now what caused the problems. Prior to yesterday's edit, I deleted from the iPad all the video footage, audio clips, project files and finalized video from last week's introductory episode (which I normally do, to make room for the new project), but failed to hard-boot the tablet afterwards. As such, it must have still allocated memory space for those now deleted files, so once I loaded onto it the new files for this week's video, it was running out of temporary work space in memory. Just another lesson learned, something I'll have to add to my document on how to edit video on an iPad. 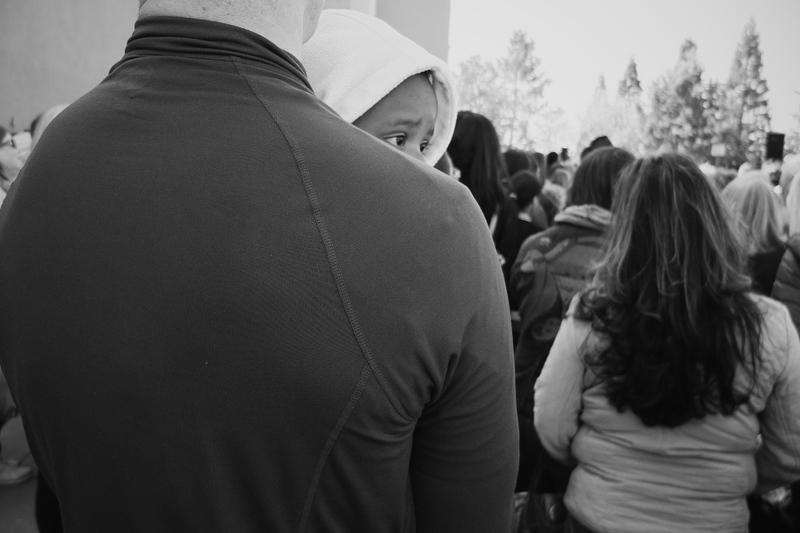 I'm not certain if I like the video style I applied to the footage in-camera. It's called a "high dynamic" feature, which renders the highlights and shadows with more detail in the kinds of high-contrast lighting that often creates harsh tones on video cameras. It certainly does render the scene with more detail in what would otherwise be harsh, overly dense shadows, helpful in that I was wearing a hat and my face would otherwise have been partially obscured in shadow; and the highlights don't appear to be blown out, but the color is a bit too vivid for my taste. Unfortunately, the iMovie software for the iOS platform doesn't provide for adjustment of video properties like color saturation and contrast, so I may have to do more experimentation with in-camera adjustments. I know I made some mistakes in my dialog, and should have re-shot some of the scenes. In particular, at one point I confused the "half-space" feature with "half-line advancement". And I didn't mention the middle, mimeograph stencil position on the ribbon selectors, nor did I make mention of the platen clutch button on the left platen knob of the Olivetti. Then there's the whole subject of segment shift versus carriage shift, which explains the difference in the ribbon color selector switch positions between those four machines. 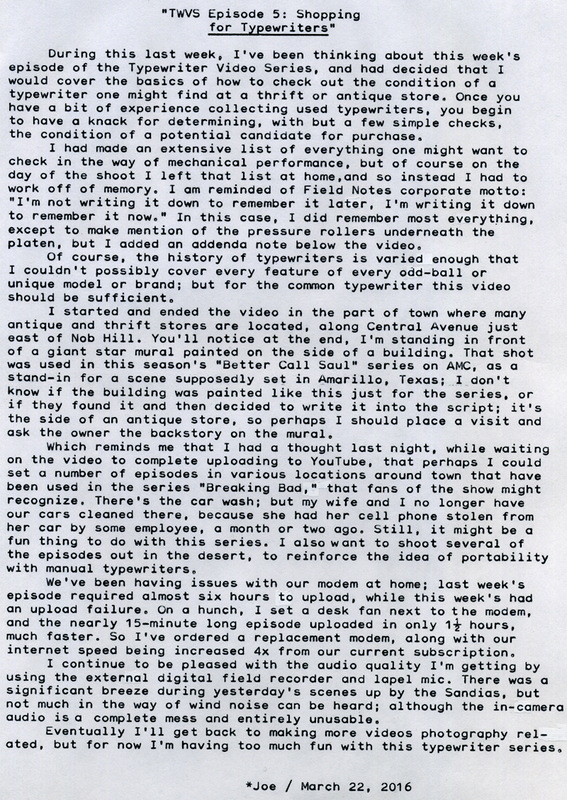 But I have opportunity to cover those features in a subsequent episode involving how to load paper and type. 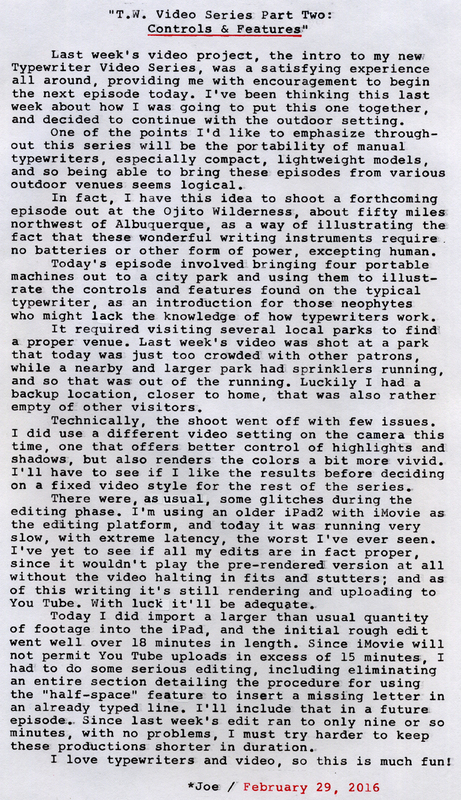 As indicated in the typecast above, I had initially included scenes that detailed how to use the half-space feature, enabling the insertion of a missing letter into an already typed line, but it got deleted from the project in an effort to shorten the running time to below the 15 minute limit, required by iMovie and YouTube. I'll just have to make an even more detailed episode at a later date, dedicated to this feature; which will also reinforce my desire to have shorter-length segments, easier for me to edit and probably easier for you to watch, as well. I've found it a challenge wearing two hats at once, involving both technical production and creative content, as on the one hand I have to concentrate on dialog once in front of the lens, but otherwise have to focus on setup of the camera and audio recorder, and review of the results between takes, all the while trying to ignore passersby in the park who might want to strike up a conversation or otherwise distract me. But this is the fun of being a one-man video shop, certainly challenging but also rewarding when it does work.